A vegetarian delight! 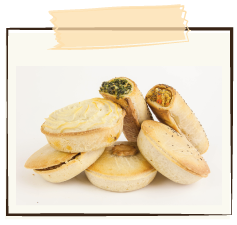 Chopped seasonal vegetables, stewed in a tomato based sauce and lightly spiced encased in our crisp, light, pastry. Wheat free, gluten free, dairy free, nut free and yeast free. 1 * 200 g pie per pack. Filling: tomato, zucchini, pumpkin, onion, potato, capsicum, mushroom, carrot, sweet potato, broccoli, canola oil, sugar, salt, pepper.